Price: With all of its helpful features and many stitch options the Singer 14CG754 ProFinish serger still comes in at an exceptionally affordable price compared to many machines in its class. Efficient: The 14CG754 model provides a number of features and capabilities to make sewing much more efficient. These features include its speed of 1,300 stitches per minute, its carry handle for added portability and its multitude of accessories, among other features. Comes with Instructional Video Although simple to use, the Singer ProFinish 14CG754 comes with an instructional video to make the process of setting up and operating the serger much smoother. Short Warranty: Although the serger comes with a 25-year warranty for manufacturer’s defects and a 2-year warranty for electrical components its warranty for parts and labor only lasts 90 days. Threading: Some users report having a difficult time threading the machine despite the fact that it has an automatic threading feature. The Singer 14CG754 ProFinish is an affordable serger with a variety of stitch options for creative versatility. It’s a great choice for those new to sewing and serging. The Singer 14CG754 serger provides a 2-3-4 thread capability with an array of stitch options. Included in these are four built-in rolled hems to assist in creating products with a professional look. Stitch styles include a Two-Thread Wrapped Edge Overlock, Three-Thread Wrapped Edge Overlock, Two-Thread Standard Rolled Hem, Three-Thread Flatlock, Three-Thread Overlock Stitch and Four-Thread Mock Stretch Stitch. The easy rolled hems and decorative flatlock styles make creating fashionable pieces simple and enjoyable. The 14CG754 model also allows for adjusting stitch width and length. The model’s differential feed can be adjusted to keep it even during use. This allows for perfect seams on many types of fabric without puckering or bunching. It also helps prevent loose fabrics from being stretched out. The 14CG754 allows for adjusting the length, width and tension of a stitch. This is done with the stitch adjustment dial. Unlike other machines that include this feature the 14CG754 positions its dial on the side of the machine to make maneuvering easier. This model offers a color-coded threading system to make setting up, threading, organizing and changing threads much easier. 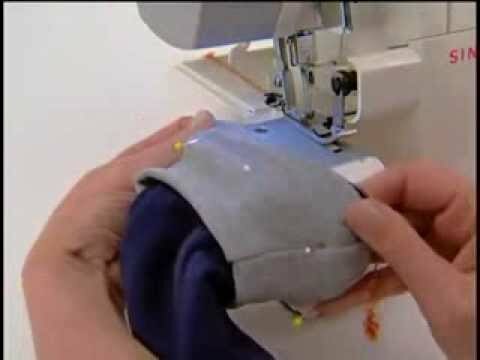 The free arm comes built in to the machine and allows for easy sewing of cylindrical pieces such as cuffs, sleeves and pant legs. It also aids in sewing smaller items for children. The free arm is accessed by removing the cloth plate. This elaborate stitch pattern is useful for sewing knit fabric. As the fabric stretches the stitch does as well. This stitch style is strong enough to be used for professional projects as it will not break upon stretching the fabric. The presser foot lifter on the Singer 14CG754 is higher than that in many other models. The added height provides a clearance that allows the user to place many layers of material under the foot. Click Here to See Singer ProFinish Serger Pricing, Pictures and Reviews on Amazon! While the Singer 14CG754 may lack some features seen on the high-end models, it still provides adequate dependability considering its price. Its stitching options, speed and adjustable components make it a machine beginners should be pleased to own.